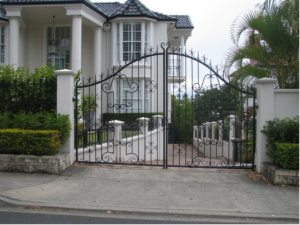 Wrought Iron Gates - Dressing up a Brisbane Home. They’re the signature item on our city’s most important and impressive buildings: Brisbane’s wrought iron gates! Brisbane’s grand homesteads, generous block sizes and contemporary “young city” feel makes wrought iron gates the ideal addition to a variety of home designs. Wrought iron gates offer such diverse options, from the imposing to the inviting, from minimalist, utilitarian design to a highly decorative and fluid motif, wrought iron offers your Brisbane home more options than any other material. That’s why it’s the material of choice for some of our most prestigious buildings. A wide, breezy Queenslander home is ideally suited to a decorative wrought iron gate. Regal spears and vertical columns are a great way to show off the structure of a Queenslander. The Queenslander’s elegant, functional design makes her a “grand old lady” of Brisbane architecture. Compliment the sparse and simple design of your Queenslander with intricate detailing while the innate visibility will highlight the pretty gardens and lawns of a wide block. Contemporary and chic, Brisbane’s new suburbs like North Lakes present the perfect backdrop for a “stand out” decorative wrought iron gate. The flexible design options available with wrought iron mean that you can opt for minimalist contemporary designs or an intricate motif for “stand out” elegance on your street. With the vast landscape that is Brisbane, larger homesteads in areas like Caboolture, Jimboomba and the Western ranges are ideal for wrought iron gates and fences. Urban country living is so chic right now and wrought iron products are the ideal way to turn an “old farmhouse” into a stately home. Wrought iron gates are the best choice for this type of home. Not only can they expand over a massive space, but they are the perfect way to create a grand entrance for your guests. Inner city living in Brisbane means converted warehouses, sleek new apartments and the oh-so-desirable cottages of Paddington and Spring Hill. Choose compact yet decorative wrought iron fencing, gates and patio balustrades to add prestige to your urban abode. Wrought iron gates make a stunning statement against white and light décor and are idea against a sandstone or tiled backdrop. The grand homes of Brisbane’s bayside have long done without wrought iron because of fear of rust. This is where your wrought iron supplier makes all the difference. Choose only a professional wrought iron blacksmith artisan to ensure your wrought iron gate or fence is properly sealed and protected from salt air. The Brisbane beachfront mansion absolutely needs to make a stunning first impression and be tough, durable and completely secure. Wrought iron is the ideal choice. Just choose quality workmanship from a reputable wrought iron specialist. Whether you have a waterfront mansion, modern estate home or a classic Queenslander in the suburbs of Brisbane, wrought iron gates make for a versatile and beautiful front gate choice. Dean Wilson Iron offers custom made fences and wrought iron gates that can suit your style and your house. For more information, contact Dean Wilson Iron today. Learn more about our craftsmanship and view our other wrought iron products now.